Succulent and sweet, wild-caught shrimp is available fresh year-round and is an excellent source of high-quality protein. Naturally low in fat, carbohydrates and calories, it is an ideal choice for a low-carbohydrate diet and healthy lifestyle. It also is a source of omega-3 fatty acid, which medical research shows may reduce the risk of heart disease. Shrimp is the most popular seafood in the United States, so it is good to know that it is a naturally renewable and sustainable resource. Most shrimp spawn offshore in deep water from early spring through early fall. They reproduce rapidly with one female shrimp releasing thousands of eggs that hatch within 24 hours. Young shrimp are carried by currents into coastal estuaries to mature. When water temperatures are warm, shrimp grow very fast. As the shrimp grow, they move gradually seaward returning to the ocean to spawn. The average life cycle of a shrimp in the wild is only 13 months or less. Some records indicate some have lived longer but those are the exception. They reproduce rapidly, which is a good thing since so many people like to eat them. Female shrimp lay over a thousand eggs, which are attached to her swimming legs. Shrimp grow very quickly. They often have to shed their old shells to grow new ones so the fit is better. Shrimp, shrimp … glorious shrimp. No matter the season, just thinking about eating succulent and sweet wild-caught Florida shrimp can be intoxicating. As America’s favorite seafood, shrimp is the perfect tastebud tickler to spark your appetite and pique your culinary curiosity. As a perennial chef’s favorite, wild-caught Florida shrimp shines in culinary cuisines from the Pacific Rim, the Italian countryside, South Beach and the bistros of Europe. Florida shrimp can be a superstar on any menu when presented simply or in creative combinations with a variety of ingredients, including Florida citrus, tropical fruit and exotic spices. There are five species of wild-caught Florida shrimp commercially harvested in the Gulf of Mexico and South Atlantic waters. 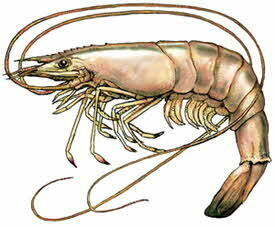 Four shrimp species are categorized by shell color: pink, white, brown, and royal red. The fifth species is rock shrimp, a smaller deep-water cousin of the pink, brown, and white shrimp with a tough, rock-hard shell. The majority of the shrimp harvested in Florida are the pink species. Tender and sweet, pink shrimp make up the majority of Florida’s wild-caught shrimp and are harvested in the Gulf and southern waters of Florida. Pink shrimp found in the southern Florida waters have light pink shells with a pearl-like texture and some have a distinguishing pink dot on the head. Those found along the northern Gulf coast may have lemon-yellow or brownish shells. When cooked, the shells turn a deeper shade of pink. The meat is white with pink skin tones, firm texture and mild flavor. Florida pinks, or gulf shrimp as they are sometimes called, are the largest Gulf species and can reach 11 inches and can live up to 24 months. The peak harvest season is in the spring (March through May) and the fall (October through December) however they are available fresh and frozen year round. Their feeding ground in the clean coral sand off the west coast of Florida gives them their distinctive color and a sweet, creamy flavor that makes them a favorite with chefs and shrimp lovers world wide. White shrimp, harvested along the Northeast Florida Atlantic coast, is a popular delicacy beloved by chefs, local residents and area tourists alike. Wild-caught white shrimp has a sweet taste and firm, almost "crunchy" meat which makes it a favorite of chefs to use in a variety of recipes. Although classified as white, the shells are actually green-gray or blue-gray in color when raw but “pink up” when cooked. White shrimp spawn in the ocean from March to November and young shrimp are carried by tides and currents into estuaries to mature. They are harvested primarily in the fall from October through December. With a life span of up to 24 months, they can grow as large as eight inches. Florida brown shrimp are harvested year round in both Atlantic and Gulf waters with the highest yields June through August. Brown shrimp are named for their reddish brown shells. Their meat has a firmer texture than whites and stronger flavor than white or pink shrimp due to higher iodine content. They can grow as large as nine inches long and have a maximum life span of 18 months. Florida royal reds with their robust, deep red color and soft, delicate texture have a unique taste that you won't find in any other shrimp. Royal Reds are frozen onboard the ships and contain more salt than other shrimp so do not add salt to the water when cooking. When simmered, the royal red stock is excellent for creating colorful, delicious sauces. Royal red shrimp are harvested in the deep Atlantic waters off the coast of St. Augustine with peak season in late summer through fall. They prefer a specific temperature zone that is usually found around 2400 feet deep that can be 40-60 miles out from shore making their harvesting more difficult than other species and contributes to the occasional limited availability of the royal reds. Both brown and royal red shrimp can be used interchangeably in any shrimp recipe. Florida rock shrimp, a deep-water cousin of the pink, white and brown shrimp, is often called “the small lobster” and boasts the sweet taste of shrimp with the firm texture of lobster. Rock shrimp derives its name from the rock-like hardness of its shell, which can easily be mistaken for a miniature lobster tail. It is fished year round off Florida's Atlantic coast and in some areas of the Gulf of Mexico. Rock shrimp typically does not grow to a size larger than 21-25 per pound. Most come to the U.S. market raw and peeled and deveined, since the tough, rock-hard shell is most easily removed commercially. It is sold fresh and frozen in local seafood markets. Rock shrimp have a sweet taste and a chewy, tender texture. The cooked meat is plump and white with red skin tones. Due to its smaller size, rock shrimp cooks very quickly; about half the time required for regular shrimp. Its smaller size makes it ideal to combine with rice, pasta, and for use in salads. Crisp texture with sweet, distinct flavor. Low fat. • Raw, headless and unpeeled shrimp: 1/3 pound per serving. • Two pounds of raw headless, unpeeled shrimp will yield 1 pound of cooked, peeled and deveined shrimp. • Shrimp are sized and sold by count (number of shrimp per pound) either whole or headless. For example, headless shrimp of 16-20 count means there are 16 to 20 headless shrimp per pound. Counts for headless shrimp range from under 10 (the largest shrimp) to 300-500 (the smallest). • Shrimp are available in a variety of fresh or frozen product forms. • The most common form is "green headless" (raw, head-off, shell-on). • "Peeled shrimp" (shell removed) are sold in a variety of forms including "PUD" (peeled undeveined), "P&D" (peeled and deveined) and "Tail-on" (peeled with the tail fin and adjacent shell segment left on). • Individually quick frozen (IQF) cooked shrimp products are available in a variety of product forms: breaded and unbreaded. • Shrimp should have a mild aroma (similar to the ocean), tightly adhering shells and firm flesh. • Store shrimp in the coldest part of your refrigerator at 32 degrees F and use within two days, or freeze at 0 degrees F for up to six months. Shrimp are easily prepared by the following methods: boiled, broiled, baked, grilled or fried.